Sunlight is a fantastic source that has an abundance of potential. Natural light brings a host of environmental benefits and can be used to create free, non-polluting energy. It’s importance in the modern home is becoming increasingly prevalent and rooflights are one of the most efficient and affordable ways to maximise sunlight in any sized room. So here are our top 3 reasons why you should invest in a rooflight this year. When installed professionally, roof skylights can lower the cost of your energy bills. By allowing more natural light into a room throughout the year, rooflights maximise daylight and significantly reduce the need for artificial lighting. The extra light from a skylight can increase the temperature of the interior thereby offering excellent thermal performance. Contemporary rooflights are a natural source of ventilation. This is an important aspect for any room as effective ventilation helps to maintain good air quality and improve comfort levels. Lite-Style flat rooflights open up by 360mm to allow air to filter and create an airy living space. Homes are being built increasingly closer together as the demand for new houses increases, and this brings a challenge of balancing the desire to maximise natural light and the need to offer privacy from neighbours. Rooflight systems are a great solution to this as they allow sunlight to come from above. This is a particularly effective solution for bathrooms where privacy and light is most important. 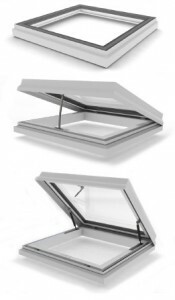 At Lite Haus UK we offer a premium range of rooflights, as a part of our Lite-Style collection. Our quality roofing systems come in two styles; flat and lanterns. Our roof windows are designed to meet the needs of the modern home using sustainable materials which deliver superior aesthetics and crisp clean lines. Different Types of Patio Doors to Transform Your Home! Registered in England and Wales. Company No. 07908228.